Eastern Africa is suffering from a severe drought for the sixth year in a row, which, according to climatologists, could endanger the upcoming harvest season and put the area at risk of famine and water shortages this year. Using satellite images, scientists have been monitoring the dry spell in parts of Kenya, Somalia and Ethiopia, known as the Horn of Africa, since January. The imagery shows that regions of the area at risk may not growing enough vegetation. The National Oceanic and Atmospheric Administration's (NOAA), Polar-orbiting Operational Environmental Satellites (POES) circle Earth, providing two images a day of the entire planet. Using the Advanced Very High Resolution Radiometer sensor, the scientists can measure the reflectivity of total vegetation, based on the chlorophyll content that gives plants their green color, says Douglas Le Comte, a drought specialist with NOAA's Climate Prediction Center. "Research has shown that crops under stress reflect differently than healthy plants," Le Comte says. "If the area is not 'greening' up, that's a good sign that there's a drought." The researchers with NOAA say the minor agricultural season, which runs from March through May, may not be able to provide enough food to sustain people until the next harvest season. This satellite image depicts the amount of chlorophyll reflecting from vegetation in the Horn of Africa. The brown areas are a result of wilting due to the current drought conditions. Image courtesy of NASA Earth Observatory. Although this is the sixth year in a row that the Horn of Africa has been exposed to a long dry spell, not all of the afflicted areas will be at risk of starvation, Le Comte says. "You can have a bad growing season and not have it be too detrimental. If the last harvest was good, there will be enough food for crisis time," he says. That is the case in Somalia, where a bumper crop of sorghum will hold them through the dry spell. Kenya, however, has experienced two seasons in a row of below-normal rains, and is going into this season with serious problems, Le Comte says. And according to the United Nations' World Food Programme (WFP), the country will have a deficit of 60,000 tons of food until the August harvest season. In Ethiopia, 49 percent of the population is malnourished, and in 2004 WFP sought 871,000 tons of food aid for the country. Despite the dismal outlook, the area is now beginning to see some widespread rains, and NOAA forecasts show more wet weather on the way. "We've had some dry spells, but it's turning wet," Le Comte says, "which is good unless it's excessive." In the extreme, the rainfall can destroy agricultural yields and create risk of flooding, something researchers are watching closely. Typically, April through June is the major rainy season, called "Gu," and for Eastern Africa, the season brings with it a risk of flooding and landslides. In 2002, according to NASA's Earth Observatory for natural hazards, tens of thousands of Kenyans were driven from their homes, and in Rwanda, almost 50 people died from flooding and landslides. 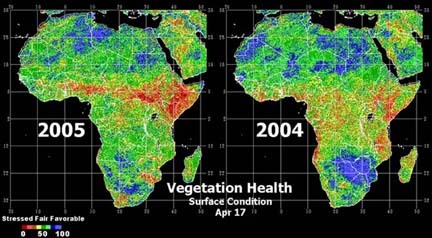 These maps compare the health of vegetation across Africa during 2004 (on right) and 2005 (left). 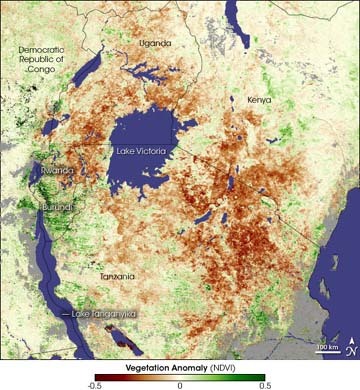 The red color depicts areas experiencing extreme drought, with the majority in Kenya, Somalia and Ethiopia in the eastern potion of the continent. Image courtesy of NOAA. Due to climate change, rainfall extremes are also increasing not only in Africa, but worldwide, says Kevin Trenberth, head of the Climate Analysis Section at the National Center for Atmospheric Research (NCAR), who is not affiliated with the NOAA research. Climate change creates a pattern that is of "heavier rains, but perhaps fewer and farther between." An area's vulnerability to drought depends on the amount of rainfall, Trenberth says; too much or too little can affect soil moisture and the water levels of lakes and rivers. "Certainly, water resources are at risk with these [climate] changes," Trenberth says. "Of course it is complicated regionally," not only by agriculture and soil type, but also by a community's ability to adapt to changes in climate. For instance, semi-arid regions around the world may be more prone to drought conditions, but they may also be more prepared for water shortages, Trenberth says. But when relatively wet areas, such as the East Coast of the United States, suffer drought, he says that poor water management and wasteful practices can intensify the predicament. Globally, these situations can be further complicated by irrigation systems, distorting the picture of soil moisture, hydrological levels of lakes and streams, and precipitation. Indeed, Le Comte says, "it's not a simple picture." Still, Trenberth says, "drought seems to be increasing around the world," with warmer temperatures creating more evaporation and thus drier conditions. According to the Climate Prediction Center, Afghanistan, parts of the Caribbean and Central America, and the Mekong Basin region of Asia are all experiencing severe drought, with portions of their populations at risk of food and water shortages. In the United States, areas of the Pacific Northwest, Wyoming and Montana are also in extreme drought conditions, Trenberth says. Even with record rainfalls and heavy snowpack throughout the winter, the lake levels remain very low, perpetuating a five-year-long dry spell in the region.